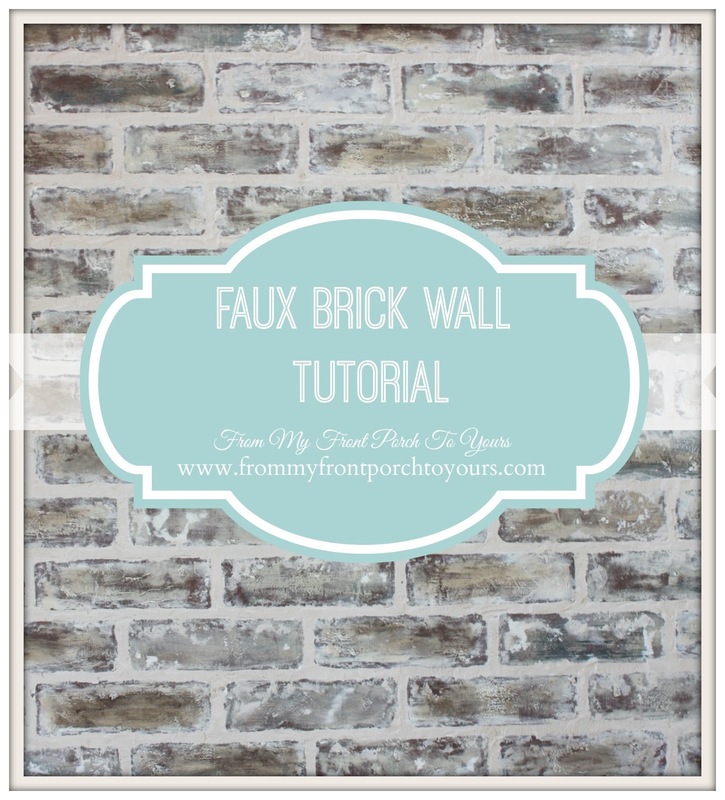 As promised I am going to try and explain how I achieved our faux brick wall finish. 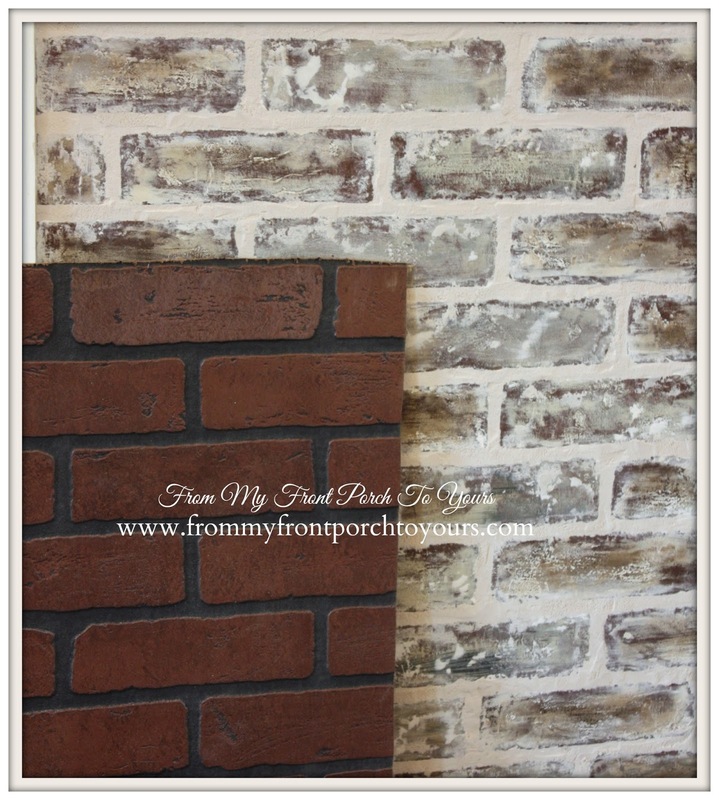 We started with two faux brick panels from Lowes. 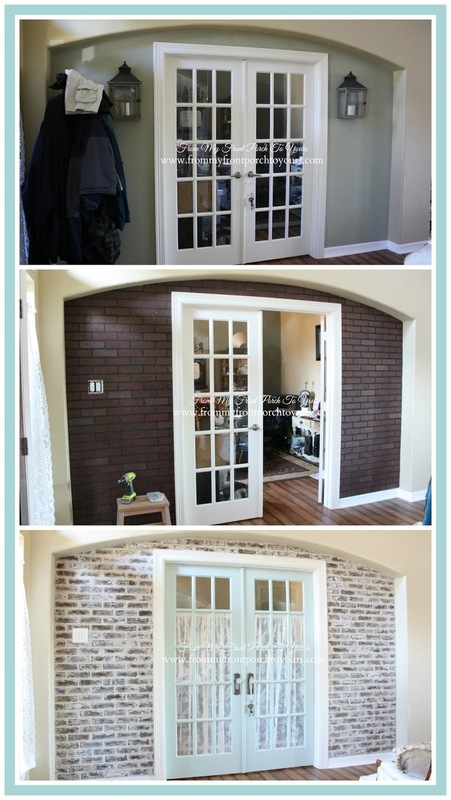 You can read about their install in my DIY Faux Brick Wall Part 1 post. Here on the left is what the panel originally looked like and the right is what I am going to attempt to try and tell you how to achieve. Artist Paint brushes- you can find inexpensive packs of them at your local craft stores. Paper Towels- Several Rolls of thick paper towels. I went thru two and half rolls. Once you have your paint supplies and joint compound I highly suggest you make a few sample boards before starting on your actual wall. Take note of which colors you use and how you placed them on the bricks. This will allow you to get a hang of the technique and decide on just the right color combination. I made three different sample boards. 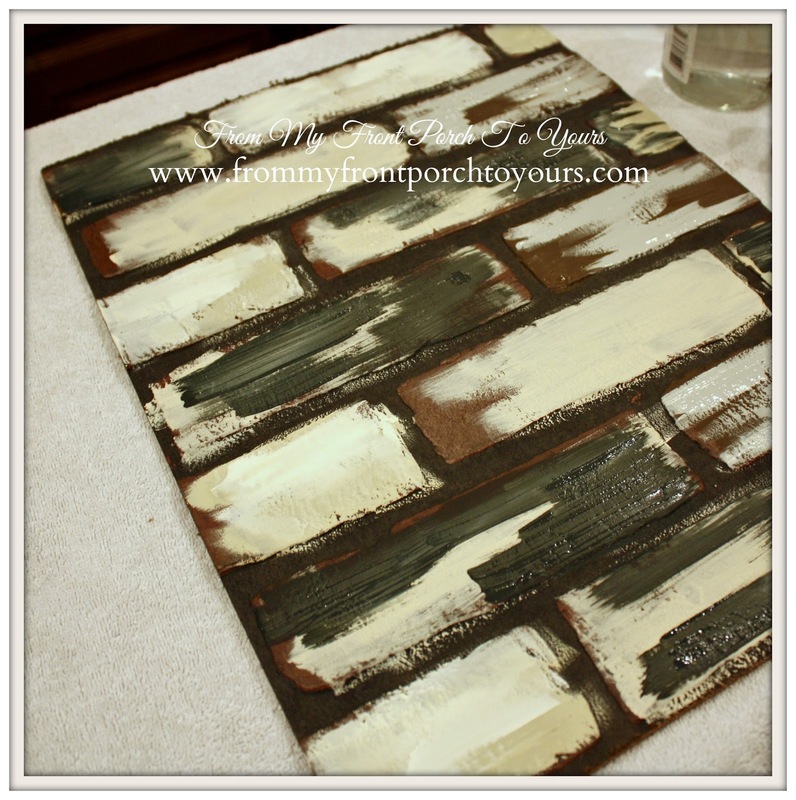 Your sample board will also allow you ease when choosing a grout color in store. Before you get started take note that you want to work the wall in sections. DO NOT attempt to do the entire wall all at once unless you know for a fact that you will be able to complete your entire wall from start to finish the same day. Trust me when I say this is not possible! My tip is to take pictures along the way after you add your paint layers. This way you can look back at the pattern you started with and can continue on with it with the next section. Hopefully this will make sense after you read the steps. The first thing I did was go thru my supply of Chalk Paint to see what colors I thought would work well for my brick coloring. I chose to use Chalk Paint because it is very easy to work with, goes on practically anything, and has a vintage finish. I have no idea what your finish will look like if you prefer to use latex. The steps would be completely different as far as the painting process goes and the finishing process. I know you could more than likely achieve a very similar look by using latex paint but I would not be able to tell you how since I did not use it. Old Ochre, Old White, French Grey, Country Grey, Graphite, & Coco. 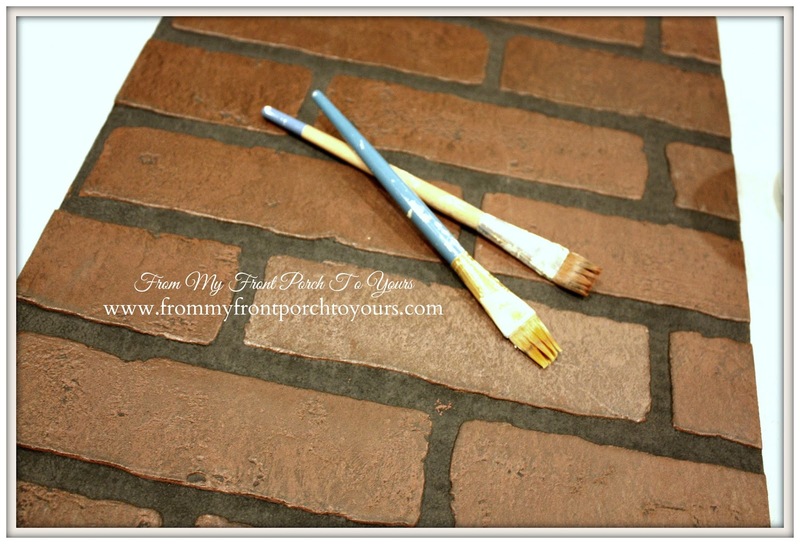 The colors you use will depend on what you are trying to match your brick to. You may want more red in your brick or more brown or what have you. Just look at the color chart and pick the colors you think will work best in your space. Depending on how large of a space you are trying to faux will depend on whether you need to purchase the sample pots or the full quarts. I got away with using sample pots of the Graphite and Coco because I was not fauxing an entire wall. I used wide artist brushes to apply the chalk paint. If you want you can use a regular brush but I would suggest sticking to one no larger than 1" to 1.5". Another possibility is to use foam brushes. You just have to decide what you would prefer to apply the paint with. I started with the lighter colors and staggered them. The great thing about this project is that there really is no right way or wrong way to choose the colors. Just layer your colors on top of each other. Of course you want to let each layer dry for a few minutes before applying the next color. The great thing about chalk paint is that it dries fairly quick. Do not apply paint to the entire brick. Just haphazardly paint the colors on. After I applied the lighter colors I topped them with the darker colors. To achieve a darker brown all I did was add a little Graphite to the Coco. Pay attention to your pattern and remember to stagger the colors just like you would see in real brick. This is when you want to take a few pics since you should only be working in sections. Once you have completed applying your layers let them dry. Once they are dry or pretty dry take your squirt bottle and wet your paper towel and then just start rubbing each individual brick. This is where the time consuming part kicks in. You want to work each individual brick by rubbing/blending the colors. DO NOT rub the color down to the original brick panel. You need the paint to still mostly be on the bricks. Also Do Not spray water directly on the brick. It will drip and make a huge mess. 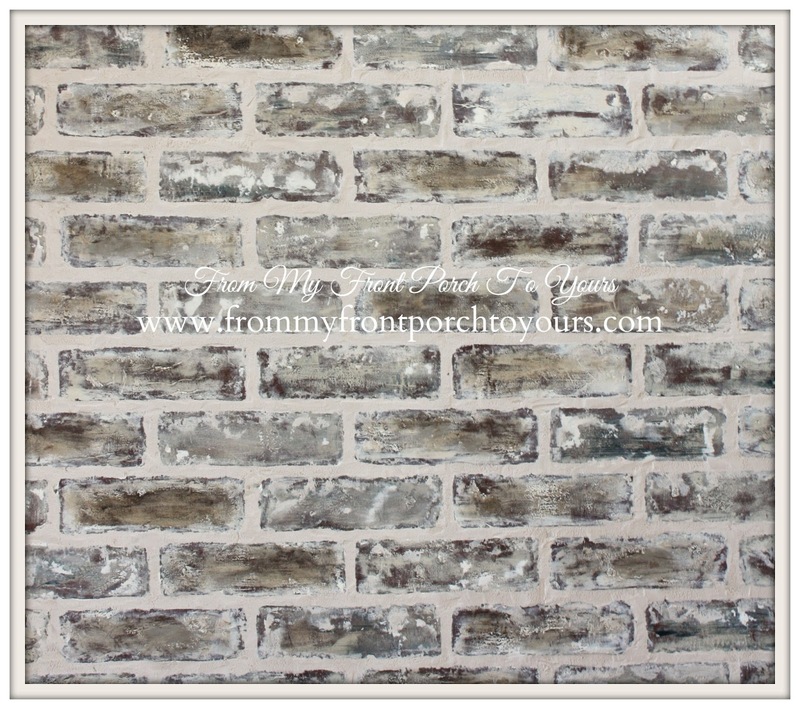 Here is what your wall will look like once you have blended each brick. Notice that they are pretty much still painted. Sorry the pic is a little hazy. I worked mostly at night after my men were all in bed so the lighting was not that great. This is the largest I would go for each section otherwise you will be making life harder with future steps. Stand back at this point and decide if you have a pattern you like. If not add some more color and blend it in. You just have to play around with it till you achieve the color balance you like. Joint compound comes in to play next. DO NOT purchase the joint compound that looks pink to start with and dries white!! Trust me this will completely mess your bricks up because you are using so much of it that you will be able to see a pink tinge to the bricks. Yes, I know from experience! ;) I had run out of the normal joint compound and all I had was the pink stuff. Thankfully it was just a small area I used it on so with some elbow work I was able to correct my mistake. Depending on how large of a space you are fauxing will determine how many containers of joint compound you will need. I went thru one regular size one and ran out after both sides of the doors. I still had the arch section to do. 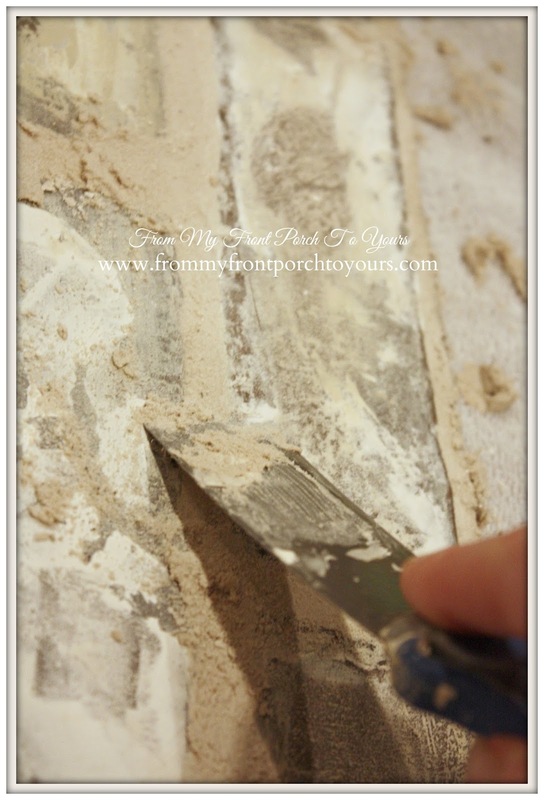 Add the joint compound with your putty knife to each individual brick again just haphazardly. Do not completely cover the bricks. This is what will give your bricks "texture". 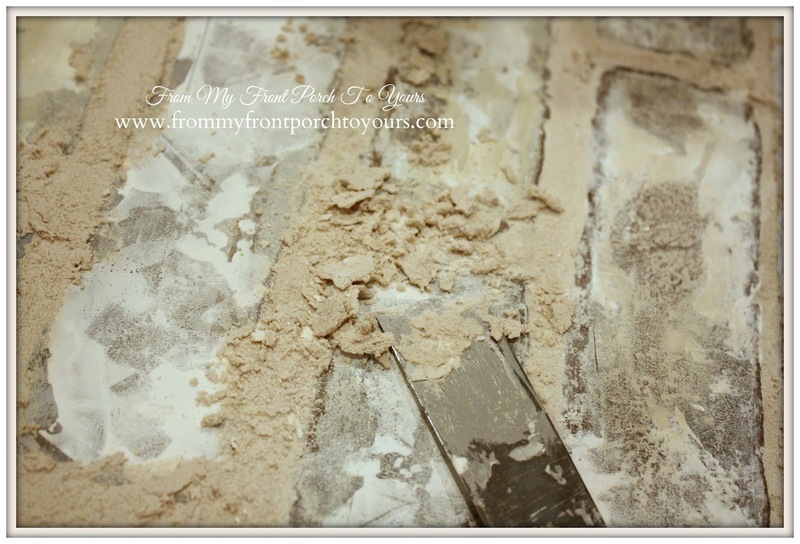 Let the joint compound dry for about 20 minutes and then take your putty knife and lightly start scrapping off the excess. Be sure to protect your floor BEFORE scrapping. This is when things start getting really messy. Do not dig deep into the compound. If you accidentally nick the panel do not freak! It will all blend in and you will not even be able to tell in the end. This is what your bricks should look like after you are done scraping the top of the joint compound. 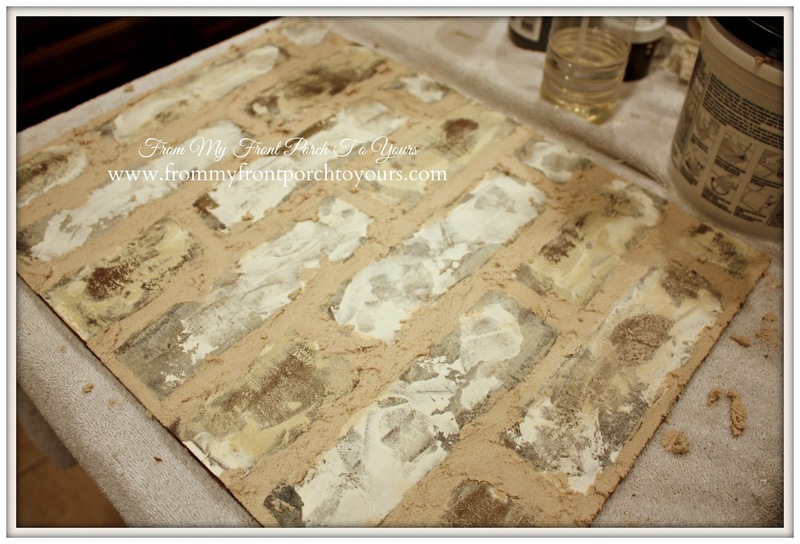 Next wet your paper towel and rub/work the compound into your brick in areas. This will also take more of the paint off but that is what you want and why I mentioned not to take too much off earlier. How much joint compound you want to rub away will depend on how much white you want on your brick. Also note if for some reason you are not able to get back to working the joint compound into the brick within 20 minutes you will have a tough time rubbing it off. All is not lost though. This happened to me and I ended up finding out that a Magic Eraser worked really well with blending it in. Again if you see that you may have taken too much off just apply some more and wait for it to pretty much dry. This project is really super easy, just time consuming. 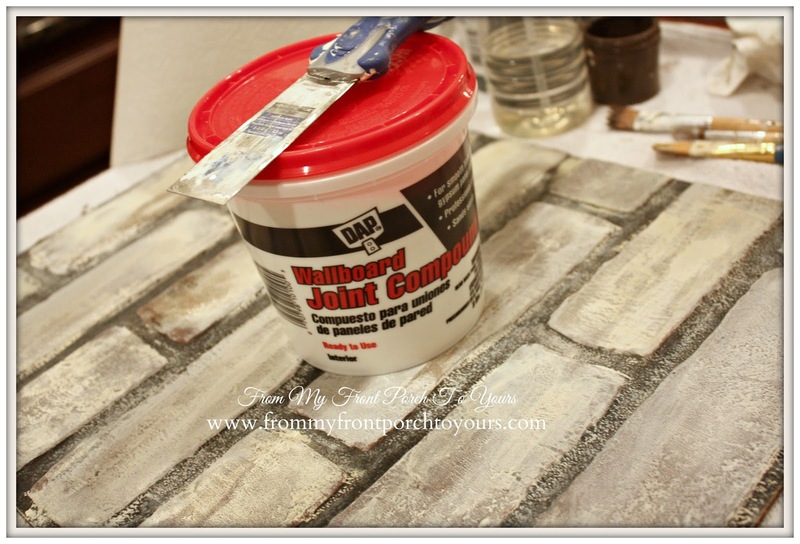 Once you have your joint compound worked into the bricks you want to start grouting. 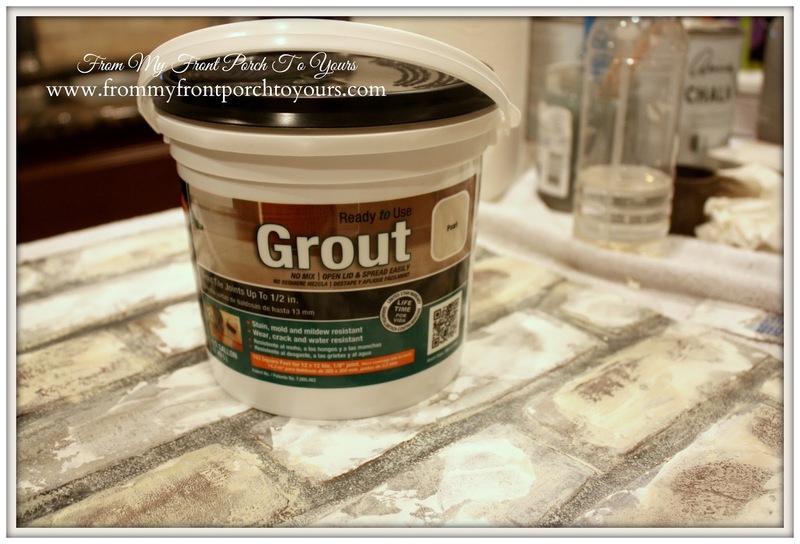 You can purchase grout you mix yourself or what I prefer is to just purchase pre-made grout. It cost a bit more but I have never been great at mixing grout so pre-made saves me time and sanity. When picking out grout color make sure to take your SAMPLE BOARD with you so you can see which color grout would work best. I brought home two colors. One sadly I had to mix on my own and turned out was the wrong color anyways. I ended up choosing Pearl in the pre-made. It went nicely with the paint colors in the bricks and with the walls and flooring in our foyer. You need to take all that into account when choosing your grout color. Pre-made grout has the perfect consistency. 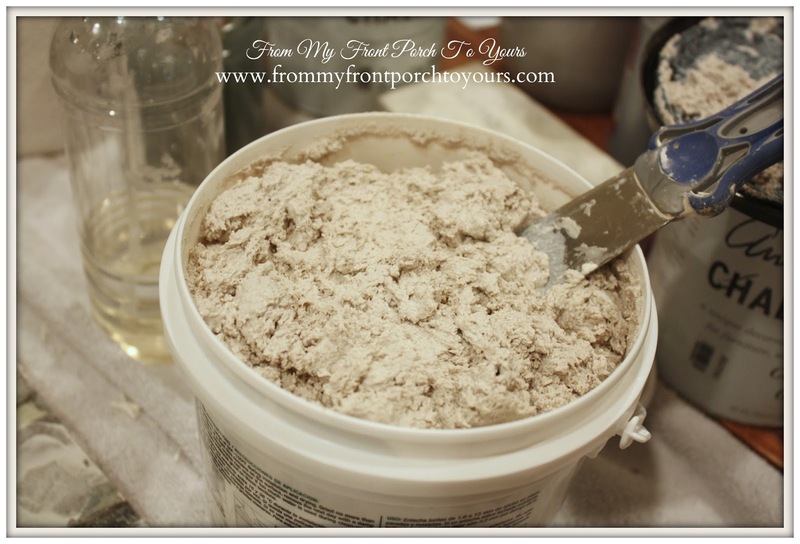 All you need to do is stir it with your putty knife from time to time to keep it from getting stiff on top. I went thru one entire tub of grout and then half of another. Continue to cover your flooring because things are about to get crazy messy. 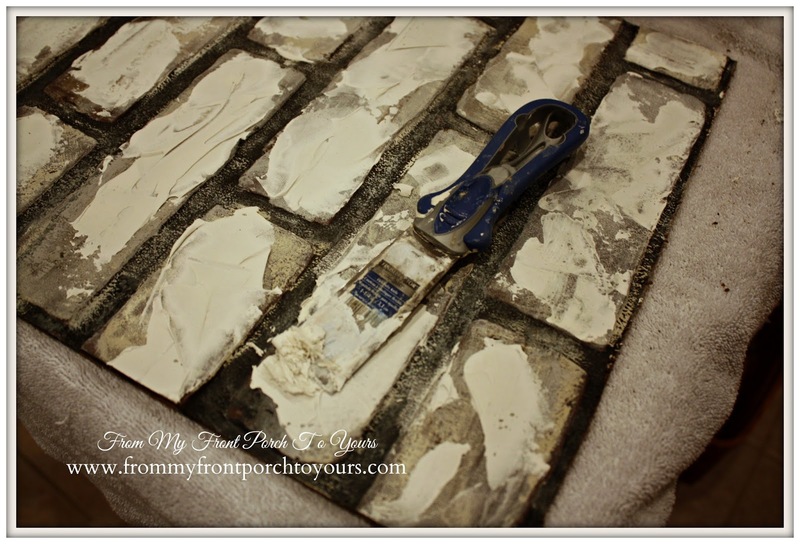 Take your putty knife and just start applying the grout to the "grout" line areas. It is sorta like icing a cake. Do not worry about being super neat with it. It is ok to cover up some of the brick. As matters fact you want to cover up some of it. You may also find that at some angels you have to use your fingers for instance around the edges where the paneling meets the corner of the wall. I chose to use grout on the grout lines as to oppose just painting the grout lines to make the brick seem more real. It adds the dimension you see with real brick. I also chose to use it because it covers up all seams and screw holes. You can not tell in the least where one piece stops and another starts! Wait about 20-30 minutes for the grout to dry some. You do NOT want it to dry all the way. If it does it will be a bear for the next step. After the grout has sat for approximately 20-25 minutes take your putty knife and gently start scraping off the excess grout. You may find that it wants to take off too much and that is ok just stop and then push the excess back on and flatten it with the putty knife. This is what you will be seeing as you scrap away the excess. Scrap over the top of all the grout and around all of the bricks unless you want some of your brick still covered up. That is a personal choice. I chose to scrap around every brick. It highlighted the bricks more. Once I was completed with the entire grout process I decided I needed to add more brown to some of the bricks. I did not want to use chalk paint again because it would have made me start the entire painting process all over. So what I did was apply clear wax to each individual brick making sure not to get it on the grout. It pulls out the colors very nicely. Then I added the antique wax to a few here and there. If I added too much I just used the clear wax to take some back off. The antique wax was just the right touch to make the brick look real. After many hours of work and knuckle scraping you will step back with a sigh of relief realizing that you actually did make a cheap faux brick paneled wall look like a million bucks. Pat your self on the back and maybe even jump for joy! 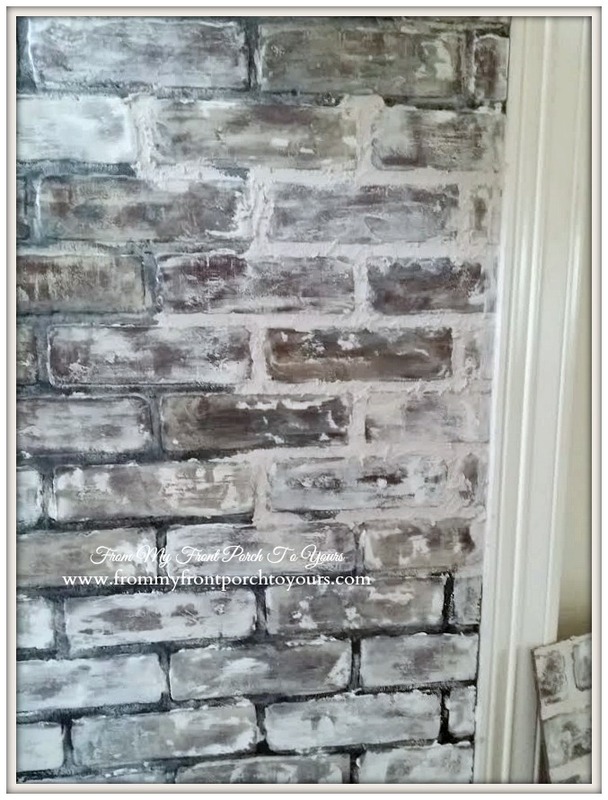 ;) You can see more of this space in my Faux Brick Wall Reveal Post. I hope that I explained things clearly enough? If you have any questions I will try my best answer them. I wish I had some better pictures but again I was working late at night into the wee morning and a lot of times pictures were an after thought. As far as cost for this project if I did not already own a lot of the supplies I estimate the cost being around $360 with purchasing full quarts of chalk paint but having a ton left over for future projects. Since I owned all the paint and wax already my cost came out at around $110. A real brick wall for this space was just over $800 and that was just for the brick pavers and no other supplies. Mind you if I had it in the budget I would have rather used true bricks but you honestly can not tell the fauxed brick panels are not real brick unless you rub your hand across one of the bricks. I am truly amazed out how it all came together and trust me Mr. Front Porch will tell you I am very picky gal. Wow Pamela...you put a lot of work into both your project and the tutorial! I love the fresh and bright new look of the brick now and wow that is a lot of BRICK! Great project great tutorial great post!!! Wishing you a wonderful weekend to just sit and admire the fruits of your labor! It turned out beautiful, Pamela, and makes such a difference in your space. 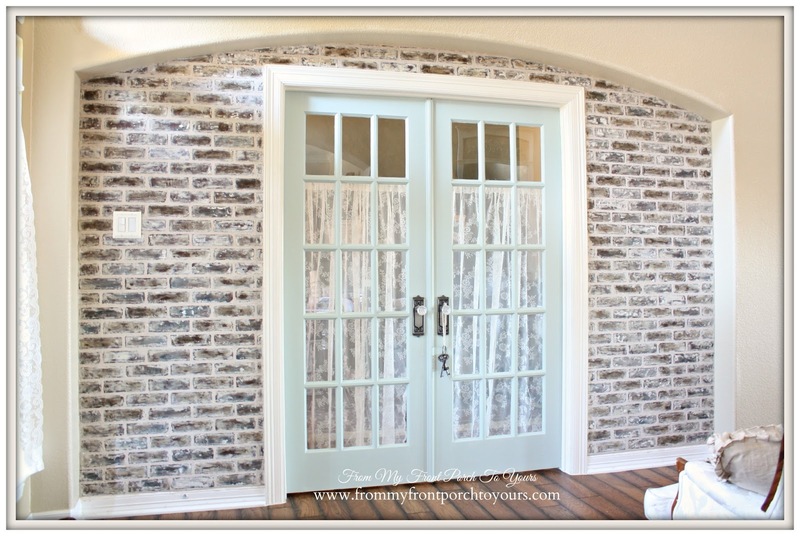 I'm getting ready to tackle a faux brick project as well, and I hope mine turns out looking so great! Wow, what a lot of layering and work, but oh the outcome is worth it. You did a fabulous job and no one would know those are faux. Good job!! Wow, it became very pretty. You did a fantastic work here. That is seriously crazy how you figured all that out, and your patience paid off it looks like a freaking brick wall!!! I am so in love with this idea, thank you for sharing it! I am going to try this in my home, but in a much smaller space. Your tutorial makes sense and seems very thorough! Thanks again! Absolutely Amazing Pamela! LOVE IT! Pamela, I am so impressed with your faux brick wall! It looks fabulous and you did an excellent job with the tutorial. Pinning! Pamela, This is so amazing! 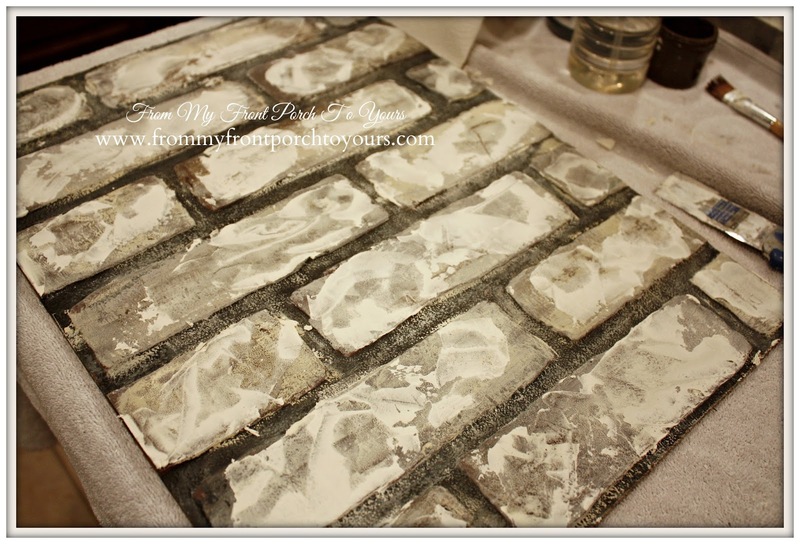 I am currently working on Faux brick myself for our room...I am going about it in a different technique....not quite sure how it is going to turn out...but yours looks amazing! Tons of work but definitely paid off! Wow, it looks great, Pamela! 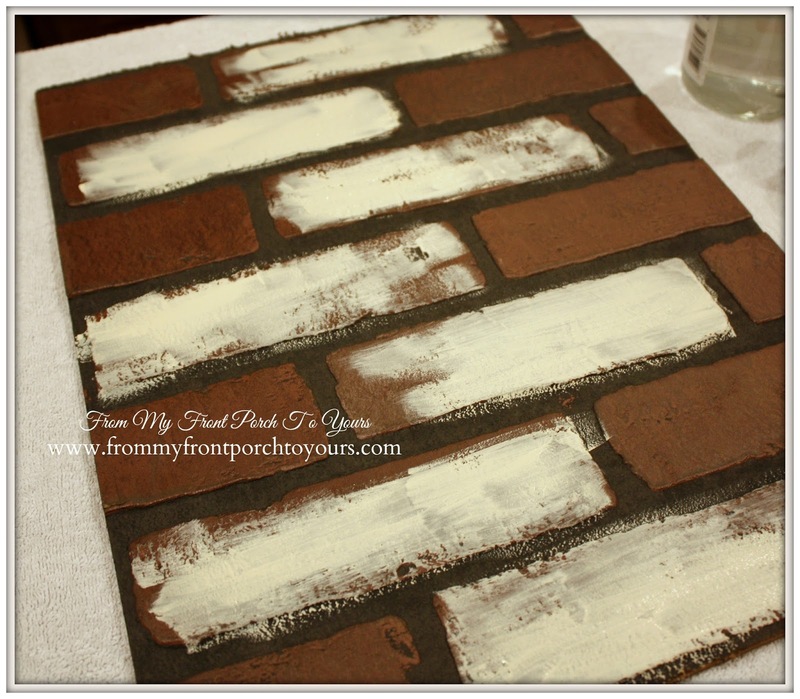 I did a faux brick project using joint compound to create the bricks. Yours looks like a much less messy process. Wow Pamela...you certainly did work very hard to achieve the look and it looks amazing!!! !....Gorgeous job!! Wow and wow! Talk about a lot of work! I love your finished project and how fantastic it looks but this girl won't be undertaking this project. Whew, I'm tired just from the tutorial! Haha. You are my hero! I was waiting for this and glad you posted. I am thinking of doing a wall like this in my home. Lot's of work but well worth the end results. Your wall looks so great. Great job!!!! Your wall looks really really great! Goes to prove if you do a job that you want to look good, you have to take your time and lots of (work) to do it. Again wonderful job...Love it!! It looks fabulous, and I know from experiance what a time consuming job this is. Looks amazing in your home. Amazing!!! You are totally creative and resourceful too!! Your directions are so easy to follow and understand. Even your warnings!!! I think you should be paid by someone ASCP?? For using her product for more than just furniture?!!!! I will DEFINITELY be trying this soon! Looks great! Honestly? One of the best if not THE best DIY projects I've seen in a long time. You nailed it. Stunning, gorgeous, fabulous, perfect. Love it! Do you think this would work for a kitchen backsplash? Hi Mari. Thank you for stopping by today. Yes, you could use it as a backsplash if you wanted to but my fear would be if any grease or anything splashed on it it would stain the finish on it. I personally would go for something like a travertine tile that looks similar to a brick like in my kitchen. To be honest taking out old tile and replacing it with new was far easier than creating the faux brick and took a lot less time. Now you could just use the same panel and just paint it white for a subway tile look and seal it with a clear sealant and that would be cool. Pamela -- Again let me say I am in awe of your creativity. I live in a rental apartment and need to do something that can be dismantled. In the meantime after commenting on your tutorial I discovered a product on Amazon, kind of a faux brick contact paper, supposedly with some texture -- it had fairly good reviews. I'm thinking of ordering a roll and testing it to see if it needs/can hold up to any further "faux-ing" a la your technique. Yes! You just add one final step: coat the panels with a protective sealer made for concrete. It waterproofs the panels and provides a matte/invisible shield that resists stains, grease, etc. It can be found in Lowes or Home Depot with the concrete stains and other products. I have been wanting to have bricks layed over the ugly concrete on my front patio area. I wonder if this would hold up to Florida weather? Your wall looks fab! Good job. You sure created an amazing wall! A lot of work, but it sure paid off! I will be looking at real estate soon, and now i need to remember to check and "brick" walls to be sure they are really brick! In the photos this looks so realistic. And it's something new to think about as I look at a room I want to "fix up." Thanks for sharing this and for taking so many photos and writing it all down in neat "chunks." It must have added a LOT of time to the whole process. Again, beautiful job! Thank you for posting this!! My husband and I are currently revamping an old general store to make into an antique shop- as most old buildings are there are additions everywhere! So much paneling & some can only be "easily" replaced with more paneling. Brick panels look ok painted but they look amazing painted when you take the time like you did and if it wasn't for you I wouldn't have known how to do such a good job! Thank you So much!! Hi Pamela! Wanted to share my before, during and after with you since your project inspired me!!! I did a lot of the steps in your tutorial. It is a TON of work but $150 compared to $500 is an easy decision! Let me know if there's a place I can send photos! I love what you've done with your wall. I have a few outdoor projects id like to make look more rustic. Id like to give some planters a textured appearance. Some of them are metal. do you think grout would adhere to metal? I would need something that would withstand the weather. Any suggestions? Looks really great! The best transformation look. Excellent job and great detailed explanation! 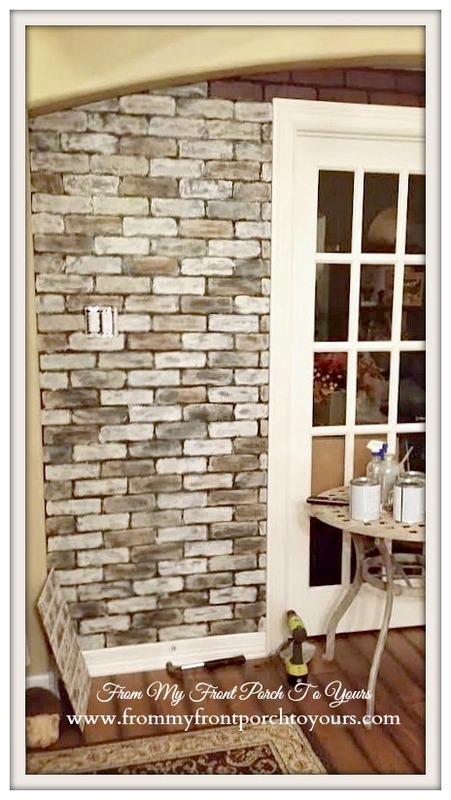 I love the colors you selected and your blending work~your wall definitely is my favorite brick "look"..I've seen something similar done on Fixer Upper (HGTV) and yours turned out just as nice, if not better! 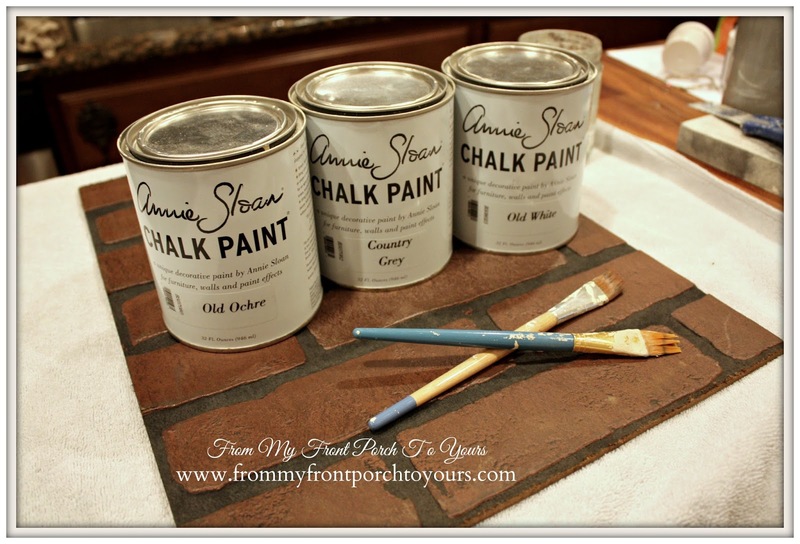 I will be ordering some of the Annie Sloan chalk paint for sure! Heard good things! Just to clarify...the compound is used for aging and texture and the grout mainly to help the brick outline stand out. Would I need to use grout?